Have you ever heard of an “industrial-organizational (IO) psychologist?” According to the Bureau of Labor Statistics this occupation is predicted to grow 53% between 2012 and 2022, making it the fastest growing career in the next decade, yet many people have never heard of it. With a median income of $83,580 a year, presence and influence in the workplace is quickly growing for industrial organizational psychologists. Unfortunately, not all companies have the resources to hire an IO psychologist, but all companies could benefit from their help. 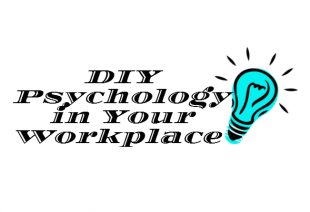 What if I told you that you can create a simplified DIY industrial-organizational psychologist for your workplace? So what is an industrial-organizational psychologist? This position applies principles of psychology to human resources, administration, management, sales, and marketing problems. They apply psychological principles to your workplace to solve problems and improve the quality of work life. Do you need help in any of these aspects of your business? Do you feel you need an IO Psychologist but don’t have the resources or don’t want to hire another full-time employee? This role may be vital to your productivity and organization in the workplace, but if you know what you need to learn and have the right resources, you can experience many of the benefits of an IO Psychologist without having to hire one. If you can’t make the $83,580 investment, you can still improve productivity, morale, and management via select elearning courses available in our OpenSesame catalog. While it is preferable to have an expert on staff, sometimes that simply isn’t possible. Here are some courses to help you DIY your company to success. Looking to design training and development, synthesize work styles, or improve how management handles employees with conflicting work styles? This course covers all that and more. These psychological perspectives on management will have you seeing big improvements in the functionality of your workplace with only small changes. I bet it will shock you to know there is psychology involved in the way we see data. This psychological course will change the way you handle data; including overcoming bias, handling influxes of data, sorting for relevance, and differentiating between the ‘what’ and ‘why’ in data. By the time you complete this course you will be able to better understand your data, improving both efficiency and accuracy. Ever wonder why some employee and employer relationships work well while others fail miserably? This course will help you recognize bad fits in advance and prevent their hire in the future. If you want to strategize employee selection, understanding the ways employee relationships work is the key to success. Having the required skill set is only one factor in a much more complicated process for hiring. Understanding the psychology behind this process can help you wade through the endless list of candidates to select those who are best for your company culture. Psychology is a field often underestimated and overlooked but extremely applicable to all aspects of the business world. It saturates every part of life and every type of interaction and can be an asset in how you handle your business, no matter your situation. The ability to grasp the way people think and how people perceive situations makes it possible to improve productivity, morale, your understanding of analytics, how you view policy, how you hire, and so many other factors in your business. The better you understand the people who work for you, the more effectively they will be able to work for you. If you are a company needing help in any of these departments, give these courses a shot and watch the functionality of your workplace reach all new heights.